Rosuvastatin, marketed as Crestor, is a member of the drug class of statins, used in combination with exercise, diet, and weight-loss to treat high cholesterol and related conditions, and to prevent cardiovascular disease. It was developed by Shionogi. Crestor is the fourth-highest selling drug in the United States, accounting for approx. $5.2 billion in sales in 2013. The primary use of rosuvastatin is for the treatment of dyslipidemia. It is recommended to be used only after other measures such as diet, exercise, and weight reduction have not improved cholesterol levels. Rosuvastatin has multiple contraindications, conditions that warrant withholding treatment with rosuvastatin, including hypersensitivity to rosuvastatin or any component of the formulation, active liver disease, elevation of serum transaminases, pregnancy, or breast-feeding. Rosuvastatin must not be taken while pregnant as it can cause serious harm to the unborn baby. In the case of breastfeeding, it is unknown whether rosuvastatin is passed through breastmilk, but due to the potential of disrupting the infant's lipid metabolism, patients should not breast feed while on rosuvastatin. Specific HIV protease inhibitors including atazanavir (Reyataz), taken with ritonavir (Norvir) and lopinavir and ritonavir (Kaletra); and spironolactone (Aldactone). Alcohol intake should be reduced while on rosuvastatin in order to decrease risk of developing liver damage. Rosuvastatin has structural similarities with most other synthetic statins, e.g., atorvastatin, cerivastatin and pitavastatin, but unlike other statins rosuvastatin contains sulfur. Crestor is actually rosuvastatin calcium, in which calcium replaces the hydrogen in the carboxylic acid group on the right of the two structure diagrams. Rosuvastatin is a competitive inhibitor of the enzyme HMG-CoA reductase, having a mechanism of action similar to that of other statins. Its approximate elimination half life is 19 h and its time to peak plasma concentration is reached in 3–5 h following oral administration. Putative beneficial effects of rosuvastatin therapy on chronic heart failure may be negated by increases in collagen turnover markers as well as a reduction in plasma coenzyme Q10 levels in patients with chronic heart failure. Absolute bioavailability of rosuvastatin is about 20% and Cmax is reached in 3 to 5 h; administration with food did not affect the AUC. It is 88% protein bound, mainly to albumin. 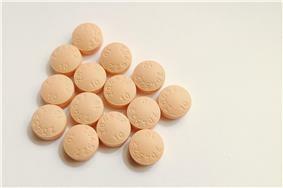 Rosuvastatin is metabolized mainly by CYP2C9 and not extensively metabolized; approximately 10% is recovered as metabolite. It is excreted in feces (90%) primarily and the elimination half-life is approximately 19 h.
Rosuvastatin is approved for the treatment of high LDL cholesterol (dyslipidemia), total cholesterol (hypercholesterolemia), and/or triglycerides (hypertriglyceridemia). In February 2010, rosuvastatin was approved by the FDA for the primary prevention of cardiovascular events. The results of the JUPITER trial (2008) suggested rosuvastatin may decrease the relative risk of heart attack and stroke in patients without hyperlipidemia, but with elevated levels of highly sensitive C-reactive protein. This could strongly impact medical practice by placing many patients on statin prophylaxis who otherwise would have been untreated. As a result of this clinical trial, the FDA approved rosuvastatin for the primary prevention of cardiovascular events. Meta-analysis showed that rosuvastatin treatment (5 or 10 mg) is able to modestly increase levels of HDL cholesterol as well, as with other statins. A study in Japanese diabetics showed the low dose (2.5 mg) can also improve HDL levels. A 2014 Cochrane review determined there was good evidence for rosuvastatin lowering non-HDL levels linearly with dose. HDL increases by 7% with no dose effect noted. Because Asians appear to process the drug differently, half the standard dose can have the same cholesterol-lowering benefit in those patients, though a full dose could increase the risk of side-effects, a study by the drug's manufacturer, AstraZeneca, indicated. The main patent protecting rosuvastatin (RE37,314 - due to expire in 2016) was challenged as being an improper reissue of an earlier patent. This challenge was rejected in 2010, confirming protection until 2016. The drug was billed as a "super-statin" during its clinical development; the claim was that it offers high potency and improved cholesterol reduction compared to rivals in the class. The main competitors to rosuvastatin are atorvastatin (Lipitor) and simvastatin (Zocor). However, people can also combine ezetimibe with either rosuvastatin or atorvastatin and other agents on their own, for somewhat similar augmented response rates. So far, some published information for comparing rosuvastatin, atorvastatin, and ezetimibe/simvastatin results is available, but many of the relevant studies are still in progress. First launched in 2003, sales of rosuvastatin were $129 million and $908 million in 2003 and 2004, respectively, with a total patient treatment population of over 4 million by the end of 2004. Typical per patient costs to the UK NHS are £18.03-26.02/month (compared to £0.85-1.37/month for simvastatin). In October 2003, several months after its introduction in Europe, Richard Horton, the editor of the medical journal The Lancet, criticized the way Crestor had been introduced. "AstraZeneca's tactics in marketing its cholesterol-lowering drug, rosuvastatin, raise disturbing questions about how drugs enter clinical practice and what measures exist to protect patients from inadequately investigated medicines," according to his editorial. The Lancet's editorial position is that the data for Crestor’s superiority rely too much on extrapolation from the lipid profile data (surrogate end-points) and too little on hard clinical end-points, which are available for other statins that had been on the market longer. The manufacturer responded by stating that few drugs had been tested so successfully on so many patients. In correspondence published in The Lancet, AstraZeneca's CEO Sir Tom McKillop called the editorial "flawed and incorrect" and slammed the journal for making "such an outrageous critique of a serious, well-studied medicine." In 2004, the consumer interest organization Public Citizen filed a Citizen's Petition with the FDA, asking that Crestor be withdrawn from the US market. On March 11, 2005, the FDA issued a letter to Sidney M. Wolfe, M.D. of Public Citizen both denying the petition and providing an extensive detailed analysis of findings that demonstrated no basis for concerns about rosuvastatin compared with the other statins approved for marketing in the United States. As with all statins, there is a concern of rhabdomyolysis, a severe undesired side effect. The FDA has indicated that "it does not appear that the risk [of rhabdomyolysis] is greater with Crestor than with other marketed statins", but has mandated that a warning about this side-effect, as well as a kidney toxicity warning, be added to the product label. Statins increase the risk of diabetes, consistent with FDA's review of the JUPITER trial, which reported a 27% increase in investigator-reported diabetes mellitus in rosuvastatin-treated patients compared to placebo-treated patients. ^ a b c d e Aggarwal, RK; Showkathali, R (June 2013). "Rosuvastatin calcium in acute coronary syndromes". Expert Opinion on Pharmacotherapy 14 (9): 1215–1227. ^ "Top 100 Drugs for Q2 2013 by Sales". Retrieved 24 August 2013. ^ a b "Crestor". The American Society of Health-System Pharmacists. Retrieved 3 April 2011. ^ a b c "Rosuvastatin". MedlinePlus. U.S. National Library of Medicine. 15 June 2012. Retrieved 1 December 2012. ^ a b c d e f "Crestor". RxList. 14 November 2012. Retrieved 1 December 2012. ^ "Package Insert" (PDF). AstraZeneca PLC. 2012. Retrieved 2012-10-18. ^ "Rosuvastatin". LactMed. U.S. National Library of Medicine. Retrieved 1 December 2012. ^ , FDA Eluxadoline Information. ^ a b "FDA Alert (03/2005) - Rosuvastatin Calcium (marketed as Crestor) Information". The Food and Drug Administration. March 14, 2005. Archived from the original on 2005-03-05. Retrieved 2005-03-20. - This page is subject to change; the date reflects the last revision date. ^ a b Nissen SE, Nicholls SJ, Sipahi I, et al. (2006). "Effect of very high-intensity statin therapy on regression of coronary atherosclerosis: the ASTEROID trial" (PDF). JAMA 295 (13): 1556–65. ^ Ashton E, Windebank E, Skiba M, et al. (January 2010). "Why did high-dose rosuvastatin not improve cardiac remodeling in chronic heart failure? Mechanistic insights from the UNIVERSE study". Int J Cardiol 146 (3): 404–7. ^ "Rosuvastatin Calcium". pp. Professional. Retrieved 21 September 2015. ^ "Core Data Sheet, Crestor Tablets" (PDF). AstraZeneca PLC. June 17, 2003. Retrieved 2005-03-20. - NOTE: this is provider-oriented information and should not be used without the supervision of a physician. ^ "FDA Approves New Drug for Lowering Cholesterol". The Food and Drug Administration. August 12, 2003. Archived from the original on 2005-02-07. Retrieved 2005-03-20. ^ Ridker PM, Danielson E, et al. (November 2008). "Rosuvastatin to Prevent Vascular Events in Men and Women with Elevated C-Reactive Protein". N. Engl. J. Med. 359 (21): 2195–207. ^ Brendan M. Everett, MD, MPH; Robert J. Glynn, ScD; Jean G. MacFadyen, BA; Paul M Ridker, MD, MPH (2010). "Rosuvastatin in the Prevention of Stroke Among Men and Women With Elevated Levels of C-Reactive Protein" (PDF). Circulation 121 (1): 143–150. ^ Fellstrom BC, Jardine AG, et al. (April 2009). "Rosuvastatin and Cardiovascular Events in Patients Undergoing Hemodialysis". N. Engl. J. Med. 360 (14): 1395–1407. ^ Jones PH, Davidson MH, Stein EA, Bays HE, McKenney JM, Miller E, Cain VA, Blasetto JW. (2003). "Comparison of the efficacy and safety of rosuvastatin versus atorvastatin, simvastatin, and pravastatin across doses (STELLAR Trial)". Am J Cardiol 92 (2): 152–60. ^ McTaggart F (Aug 2008). "Effects of statins on high-density lipoproteins: a potential contribution to cardiovascular benefit.". Cardiovasc Drugs Ther 22 (4): 321–38. ^ Katabami T (Apr 2014). "Efficacy of low-dose rosuvastatin in patients with type 2 diabetes and hypo high-density lipoprotein cholesterolaemia.". J Int Med Res 42 (2): 457–67. ^ "Lipid-lowering efficacy of rosuvastatin.". Cochrane Database Syst Rev. 11: CD010254. Nov 2014. ^ "AstraZeneca's Crestor patent upheld;No generic competition until 2016". ^ Berkrot, Bill; Tom Hals (June 29, 2010). "UPDATE 2-U.S. judge rules AstraZeneca Crestor patent valid". ^ Horton, Richard (October 25, 2003). "The statin wars: why AstraZeneca must retreat". Lancet 362 (9393): 1341. McKillop T (November 1, 2003). "The statin wars". Lancet 362 (9394): 1498. ^ Food and Drug Administration. "Docket No. 2004P-0113/CP1" (PDF). ^ Sattar, N; Preiss, D, Murray, HM, Welsh, P, Buckley, BM, de Craen, AJ, Seshasai, SR, McMurray, JJ, Freeman, DJ, Jukema, JW, Macfarlane, PW, Packard, CJ, Stott, DJ, Westendorp, RG, Shepherd, J, Davis, BR, Pressel, SL, Marchioli, R, Marfisi, RM, Maggioni, AP, Tavazzi, L, Tognoni, G, Kjekshus, J, Pedersen, TR, Cook, TJ, Gotto, AM, Clearfield, MB, Downs, JR, Nakamura, H, Ohashi, Y, Mizuno, K, Ray, KK, Ford, I (Feb 27, 2010). "Statins and risk of incident diabetes: a collaborative meta-analysis of randomised statin trials.". Lancet 375 (9716): 735–42. ^ "FDA Drug Safety Communication: Important safety label changes to cholesterol-lowering statin drugs". "Annual Report and Form 20-F, Information 2004" (PDF). AstraZeneca PLC. 2005. "Annual Report and Form 20-F, 2003" (PDF). AstraZeneca PLC. 2004. Archived from the original (PDF) on 2005-05-13. Retrieved 2005-03-20. "Highlights of Prescribing Information" (PDF). AstraZeneca PLC. 2008. Retrieved 2009-03-11. McTaggart F, Buckett L, Davidson R, Holdgate G, McCormick A, Schneck D, Smith G, Warwick M (2001). "Preclinical and clinical pharmacology of Rosuvastatin, a new 3-hydroxy-3-methylglutaryl coenzyme A reductase inhibitor". Am J Cardiol 87 (5A): 28B–32B. "Rosuvastatin (Crestor) Information". eMedicineHealth. 2005-10-16.